South Africa's Cameron van der Burgh has pulled out of the French Open this weekend, though he hopes to be ready in time for Worlds. 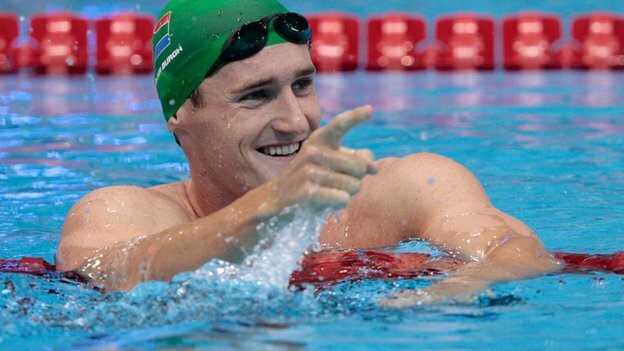 South African swimming superstar Cameron van der Burgh, the World Record holder and defending Olympic Champion in the 100 breaststroke, has pulled out of the French Open this weekend and is returning home to South Africa. The injury seems to have been suffered on Thursday at the Nilox Cup in Torino, Italy. 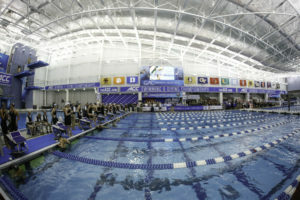 In front of a sold-out crowd, the competition took on a knock-out format that had swimmers contesting rapid-fire 50’s, four minutes apart, with the slowest 2 being knocked out in each round. Van der Burgh came away with the win, but paid the price it would seem. Any sort of pain involved with the knees is the last thing that a breaststroker wants to hear. It would be a blow to van der Burgh if the injury lingered, as he will be 28 years old (relatively aged by a swimmer’s standards) by the Rio 2016 Olympics. 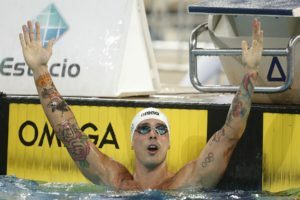 He was the bronze medalist in both the 50 and 100 breaststrokes at the 2011 edition of the World Championships. 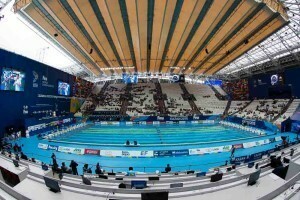 The French Open will run Saturday and Sunday in Vichy. A preview can be seen here. i know this dead horse has been beaten to a pulp over and over again. but here goes! i bet he strained his knee with all those xtra dolphin kicks he does off his walls. Let’s just hope his knee does not recover for the worlds. I do not want our kids to watch him winning. – “Olympic champion” … In my opinion I consider him to be a loser because he cheated. He knowingly broke a rule to his benefit on his way to victory. 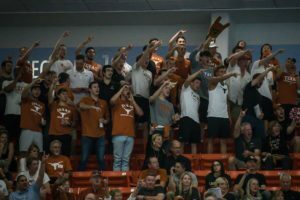 – No, he did not do what every other breaststroker did. 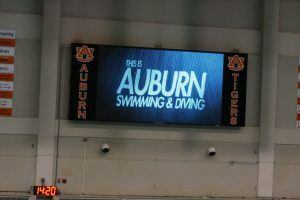 Every breaststroker did not do multiple dolphin kicks. Some did, but not every. – Again, they are not all at fault, Only the select few who do multiple dolphin kicks are at fault. – Correct, good solution! At least you didn’t suggest allowing dolphin kicks. -Actually he is not at more fault than Cameron. He isn’t the one who chose to cheat on his way to victory. I guess the saying “cheaters never win, and winners never cheat” doesn’t hold true in this instance. That said, there’s no use crying over spilt milk. While what van der Burgh did was wrong, it happened almost a year ago and it’s useless to carry on the conversation. He did something demoralizing and that’s that. What will be the true test of character, however, is whether he cheats again (either without mentioning it or coming out and telling us). For now, though, criticizing him for past occurences are only going to ingnite more unnecessary derogatorty conversations and take our attention away from the reason why we’re all here (swimming, of course! Fun, right?). So the fact that Lochte does a fly kick after each breaststroke kick in his 400IM is excusable but when Cameron does 3 and actually owns up crying for change to take place its a sin? 3 kicks at the start vs 30 kicks over 100m? Sprenger did fly kicks into the wall in the semi too yet you hail him as a gracious man? Stop pointing out the fall man when the whole community is guilty. Andrew, you can disagree with someone, but when you stoop to personal attacks, you’re just making yourself look stupid. No one is really attacking van der Burgh. He cheated and blatantly admitted to it. Philip Johnson – I think the attack by PsychoDad became personal when he said that he hopes van der Burgh’s injury doesn’t heal. Thanks Braden, I didn’t see that initially. Christian Sprenger – by the accounts I have heard- did not multiple d kick. If so then perhaps we ought recognise how gracious he was for the silver. This would go well with his wonderful looks. He can sing also. Sort of the Hugh Jackman of the pool. I believe Sprenger did in the semi though… Thereby shouldnt have been swimming the final. i blame the results regarding kitajima in 2004 for all this mess. All blame should be directed to FINA, not to swimmers.